It’s often a challenge during the holidays to find a cocktail that is either distinctive or new-fashioned. This season, I have been lucky to find two such cocktails—both use the festive and holiday appropriate cranberry juice. 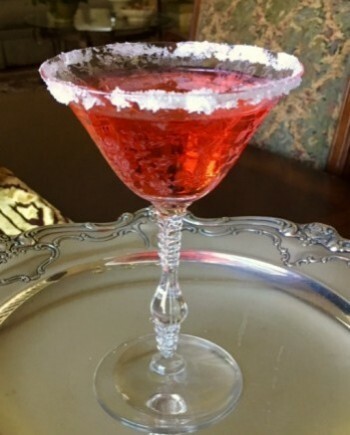 My first cocktail, Santa’s Kiss, comes from the husband of a longtime friend. One of the pleasures of social media for the baby boomer set, who didn’t come of age with the advantages of email addresses or cell phones to maintain early friendships, is that on occasion you are reunited with a long, lost friend. Such was the case with my friend, Julie. My husband and I moved from Oregon to California in the eighties, she moved east, and along the way we lost touch. Somehow, after a few decades, and through the mysterious algorithms of Facebook, she found me, and I joyfully accepted her friend request. 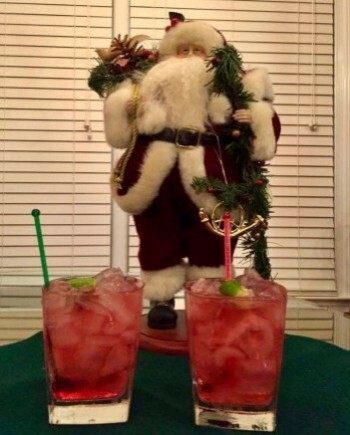 When I saw her posting on the Santa’s Kiss Cocktail, I knew it would be perfect for my holiday cocktail column. 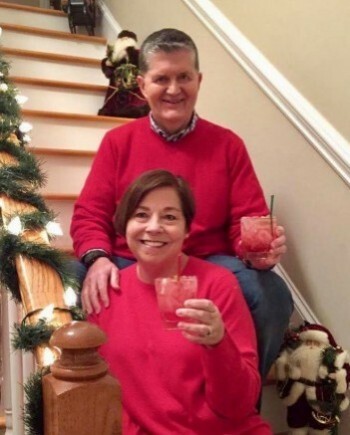 David and Julie wanted a signature cocktail for their Christmas Party, so David created this delicious, refreshing drink. One note – David says that using purchased clear ice, rather than ice from your refrigerator/freezer, is essential for the cocktail’s flavor and appearance. Fill a chilled rocks or old-fashioned glass with clear ice. Pour in the gin; add cranberry-pomegranate juice. Finish by pouring tonic water up to the top of the glass. Squeeze in a section of lime and then rub the pulp of the lime around the brim. Place the lime in the glass. Stir and serve with a festive swizzle stick – enjoy! Makes one serving. My second festive cocktail comes from the cookbook, Birmingham’s Best Bites by Martie Duncan and Chanda Temple, with photography by Arden Ward Upton. Proceeds from the sale of the cookbook benefit the Birmingham Public Library (http://www.bplonline.org). Vickie S. Ashford, Director of Travel Media, Greater Birmingham Convention & Visitors Bureau (http://birminghamal.org), presented this delightful cookbook of fabulous southern recipes to me at the October 2016 International Food, Wine, and Travel Writers Association (IFWTWA) Conference. The Destin Cocktail originated at Birmingham’s Five Bar (five-bar.com/bar-locations/birmingham-alabama/).